After seven years since the last game was released (and almost 13 since the last in the main series), Kingdom Hearts III is finally here and it’s a jumbled, beautiful, perplexing hot mess… but it’s also an entertaining one. The new worlds it brings are excellent and the third-person, real-time combat is still a blast. But the plot? It’s a burning trainwreck and best not thought about too closely. 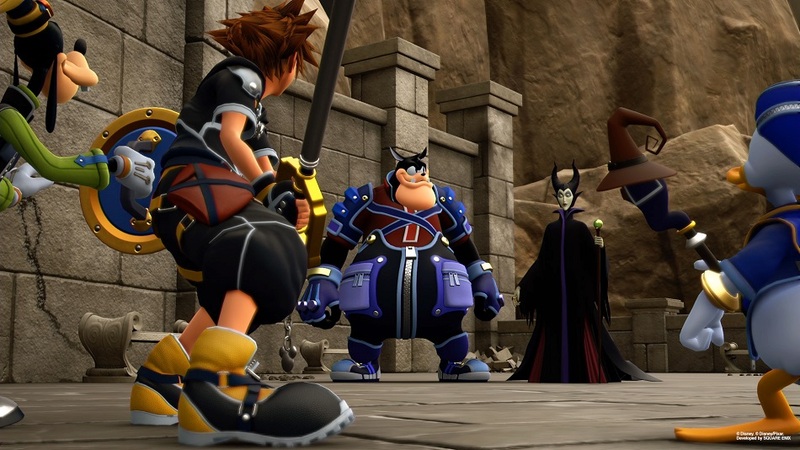 Picking up immediately where the 3DS spinoff Dream Drop Distance from 2012 ends, Kingdom Hearts III follows protagonist Sora along with Disney stars Donald Duck and Goofy as they attempt to derail the machinations of the newly-revived Organization XIII and their leader, Xehanort. Xehanort plans to disrupt the balance of the universe by unlocking Kingdom Hearts, a nebulous source of infinite power, in order to recreate existence according to his own desires. 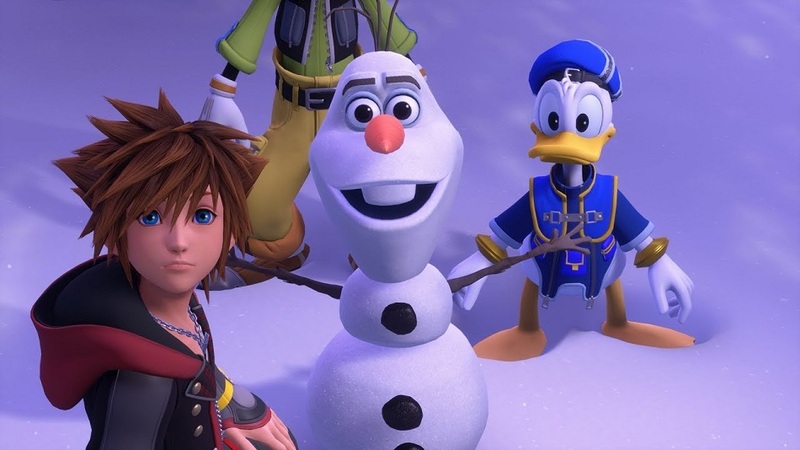 Along the way towards thwarting Xehanort, Sora and friends will have to visit many different worlds, most of which are based on popular Disney movies such as Frozen or Big Hero 6. Being the climax of roughly 18 years of story, it’s easy for anyone choosing this as their series jumping-in point to get lost in the plot. In fact, the biggest issue I have with Kingdom Hearts III is that extensive knowledge of every game in the franchise is required. Since 2002 there have been roughly ten games spread out over the PS2, Gameboy Advance, 3DS, PlayStation Portable, a Japan-only released mobile game, and even a browser game. Miss even one and good luck trying to figure out what the hell is going on. The game does have a “Memory Archive” feature that’s supposed to bring new players up to speed, but I found it to be woefully inadequate despite containing over 20 minutes of video summation. Even the individual worlds assume that players have seen their respective films. Key scenes and explanations are cut out, leaving those who haven’t watched every movie with unanswered questions. For example, in the Kingdom of Corona from Tangled, a character introduced as Flynn Rider suddenly starts being called Eugene without a second thought. Now, those who have seen the movie understand why, but without that prior knowledge it’s just confusing. I’ve never seen a series as narratively hostile to newcomers as Kingdom Hearts is. Despite being incomplete CliffsNotes versions of their proper movies, bringing in newer Disney franchises is Kingdom Hearts III’s greatest strength. Worlds from Frozen, Tangled, Monsters Inc., Toy Story, & Big Hero 6 keep it fresh — a welcome move since previous entries were starting to feel repetitive with how they would retread familiar ground. Far too often Kingdom Hearts gone back to the same well when it comes to locations — I really didn’t need to experience Traverse Town or Hollow Bastion yet again, so it’s exciting to see some new blood in the mix. Moreover, most of the places Sora and pals visit are completely unique in how they play from one another. For example, for most of the Pirates of the Caribbean, I was able to sail around on my own, personal boat and explore the seas. Sora could pull up next to an island, hop off, and search for hidden treasures or hunt down a tough-as-nails ghost ship. It was more than a little reminiscent (in a good way) of my beloved Assassin’s Creed: Black Flag, all the way down to a rudimentary upgrade system for the ship itself. Toy Story was set in a three-floor mall where toy mechs could be piloted, momentarily making it a first-person shooter. Big Hero 6’s single (yet massive) map of San Fransokyo briefly makes Kingdom Hearts III an open-world adventure. It feels as if the developers were rooting around in their design toolbox and wanted to make sure every modern videogame genre found its way here in some fashion, and it mostly works. Regardless of whatever world I visited, a quality shared between them was just how amazing they all looked. Each and every scene from the game could have been slipped into their corresponding movies and no one would be the wiser. Nowhere is this more apparent than in Tangled and Frozen, with the latter seamlessly slipping in a full rendition of Let it Go. Yes, the sudden appearance of a musical number was jarring, but visually, it melded in nicely. Another quality shared between worlds is that eventually Sora will have to pull out his trusty keyblade and start mowing down some Heartless, Nobodies, or Unversed. Combat is relatively simple realtime action shown from a third-person perspective and offering a single button for attack, and another for blocking and dodging. Magic and items can be assigned to hotkeys that are pulled up with a shoulder button, but the available slots are limited. If I ever found myself needing to use something that I didn’t have preset, I’d have to navigate through menus while the fight was still going on, splitting my attention between dodging enemies and reading small text in menus trying to find that one Blizzard spell I didn’t have hotkeyed. It’s highly cumbersome, but fortunately it was only necessary a handful of times in my playthrough. Aside from that menu issue, the combat is where where Kingdom Hearts has always shined for me. Watching Sora become increasingly more acrobatic as the game progresses and wiping out scores of enemies is always a nice treat. Each level Sora gains will usually unlock new abilities that improve his abilities in combat, like gaining a longer dodge or increased combos. By the end, a fully-powered Sora is a dervish of almost unstoppable keyblades. The many keyblades acquired throughout can individually be made stronger, increasing their stats and sometimes adding new abilities. Some are better at magic, others at attacking, but all of them come with both a ranged attack called a Shotlock and a powered-up stance called a Form Change that activates when enough hits are landed. Shotlocks and Form Changes vary wildly from weapon to weapon and up to three keyblades can be equipped at the same time, so they can be swapped during combat. Unfortunately, none of the forms never felt as strong as the Drive Forms from Kingdom Hearts II. In fact, the excitement in KHIII doesn’t quite live up to the general bar set by Kingdom Hearts II. By the end of that PS2-era gem, Sora was literally fighting an entire city. Here, the action is far less grandiose — in fact, as the grand finale to a story Square Enix has been building up to over several years and several entries, it’s almost anticlimactic by comparison. 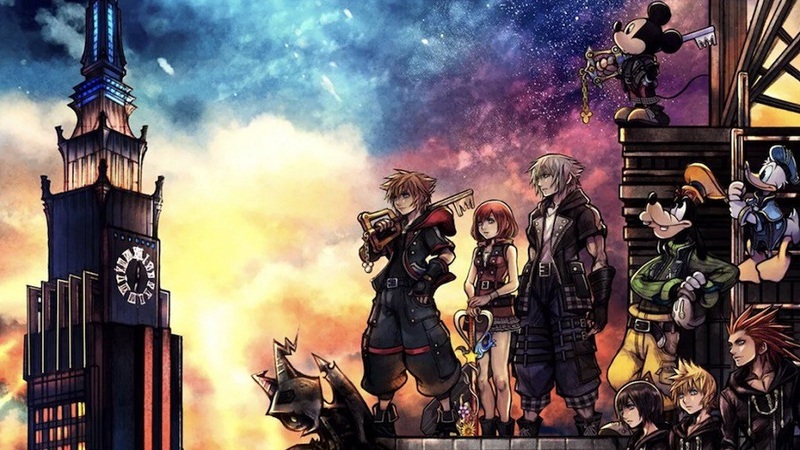 At least everything gets wrapped up in a fairly tidy way by giving Kingdom Hearts III a satisfying conclusion that ties up most of the confusing loose ends that left me happy with the state of the world. Yes, there are a few hanging threads that the inevitable sequel can pull upon, but hopefully now that Xehanort’s story is concluded the developers can start with a relatively blank slate next time. Disclosures: This game is developed and published by Square Enix. It is currently available on PS4 and XBO. This copy of the game was obtained via publisher and reviewed on the PS4. Approximately 42 hours of play were devoted to the single-player mode, and the game was completed. There are no multiplayer modes. Parents: According to the ESRB, this game is rated E10+ and contains Adorable Flan, Alcohol Reference, Confusion, and Fantasy Violence. This is essentially a Disney movie turned into a videogame. Most of the same themes you will see in those, such a the value of friendship, fighting against evil, etc. will be present here. It’s a series aimed at kids and the content reflects that. Deaf & Hard of Hearing Gamers: Enemies spawn with a distinct noise alerting someone to their presence before the battle theme starts. Usually it will happen in front of Sora so it will be seen, but sometimes a few will pop up behind and they can catch the player unaware. Party members will sometimes quip where items can be found. For example “I bet there’s something here!” or “This will be a great place to find some ingredients!” and while most of the time these show up subtitled, it’s not always guaranteed to happen. Remappable Controls: The controls are not remappable. There is no control diagram. Movement is controlled with the left stick, the camera with the right. X is attack/action while O is jump. The directional buttons control battle menus and the left shoulder buttons trigger special attacks. The right shoulder buttons control Shotlocks. It’s great to hear an honest and precise review rather than the whole company obsequious reviews. Thanks for the points. 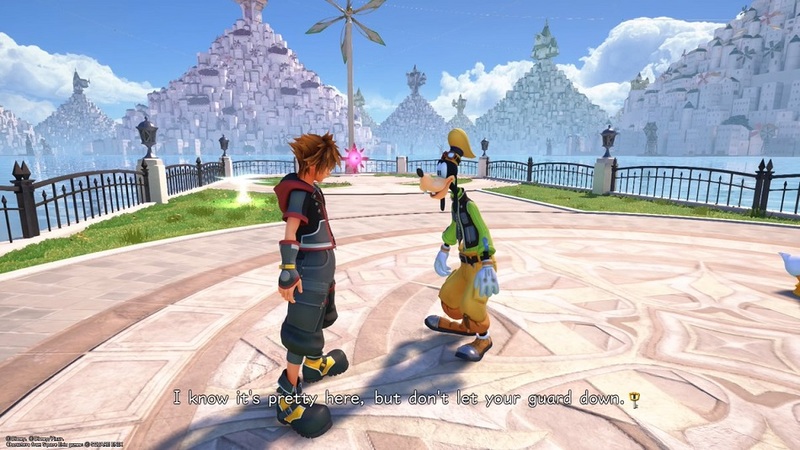 While I find Kingdom Hearts 3’s visuals astonishing, the dialogue is just exceptionally cringy. Anyway, anyone up for a real awesome Kingdom Hearts experience, they shouldn’t miss Kingdom Hearts 2 before hopping to KH3. I mean, it literally ends on a cliffhanger involving the established cast.